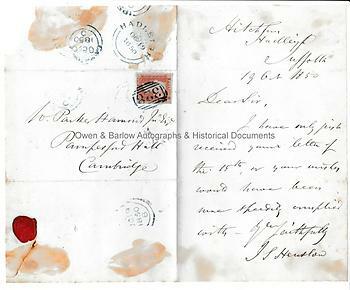 JOHN STEVENS HENSLOW Autograph Letter Signed. British botanist and geologist. Teacher and mentor to Charles Darwin. ALS. 1p bifolium folded with integral blank leaf used as postal address leaf. Hitchham, Hadleigh, Suffolk. 19th October, 1850. To Parker Hammond Jr., Pampisford Hall, Cambridge. "I have only just received your letter of the 15th, or your wishes would have been more speedily complied with. Yours faithfully, J.S. Henslow." 8vo. 19 x 11 cms (7.25 x 4.5 inches). 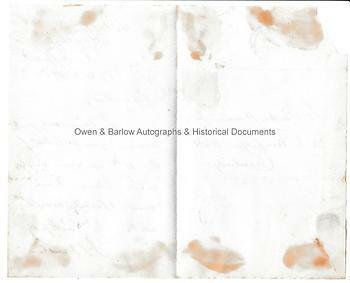 Some old mounting stains to verso, else fine. John Stevens Henslow is now best known for his considerable scientific influence on the young Charles Darwin. With ADAM SEDGWICK, Henslow was a founder of the Cambridge Philosophical Society in 1822 and in the same year was appointed professor of mineralogy. However, it was botany that was to claim Henslow's chief interest and in 1829 Charles Darwin joined his botany course and assisted Henslow in experiments in varying plant growth conditions to produce different results, a form of early biological manipulation and genetic selection. In 1831 John Stevens Henslow was invited to sail on the two year voyage of HMS Beagle. His wife, however, was strenuously opposed to the idea so, instead, Henslow wrote to Captain Fitzroy declining the opportunity but recommending his young protégé, Charles Darwin. Consequently, it was Henslow who was directly responsible for this momentous event in the life of Darwin and the ultimate consequences for science. Whilst on the expedition Darwin applied much of Henslow's teaching which caused him to ponder some of the principles that would lead to his theory of natural selection. Darwin corresponded with Henslow during the voyage and subsequently and Henslow's teaching continued to influence him throughout his work on 'The Origin of Species'. 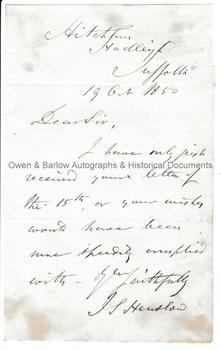 Autograph letters of Henslow are uncommon.